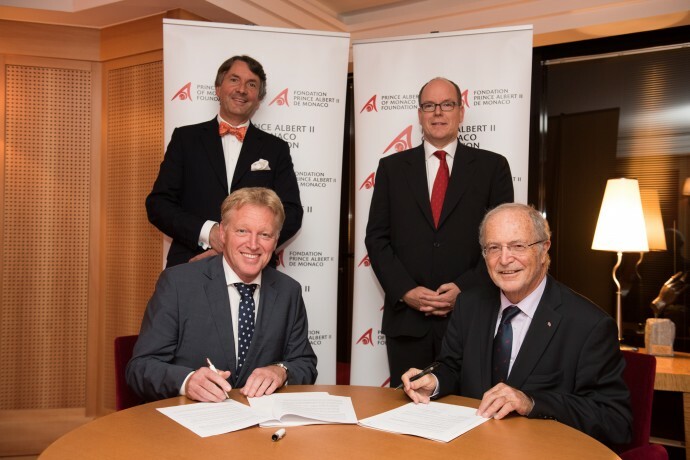 Rewilding Europe and the Prince Albert II of Monaco Foundation officially signed a partnership agreement, to identify and conduct joint projects in line with both organisations’ fields of interest and geographical priorities. The signing ceremony took place at the Grimaldi Forum in Monaco, in the presence of HSH the Prince of Monaco, alongside the Eighth Award Ceremony of the Prince Albert II of Monaco Foundation and the world premiere screening of ‘Les Saisons’, the latest documentary movie produced by Jacques Perrin and Jacques Cluzaud to rediscover the European lands that we have shared with wild animals from the last ice age until the present day. CEO and Vice-President of the Prince Albert II of Monaco Foundation, Mr. Bernard Fautrier (right) and Managing Director of Rewilding Europe Mr. Frans Schepers (left), signing the partnership agreement in the presence of HSH Prince Albert II of Monaco (right) and Mr. Wiet de Bruijn, Chairman of Rewilding Europe Supervisory Board (left). With the support of HRH Princess Laurentien of the Netherlands, who is a Special Advisor to Rewilding Europe, the Prince Albert II of Monaco Foundation and Rewilding Europe started exploring possible cooperation earlier this year. After a successful meeting in July, both organisations decided to officially sign a partnership allowing for further partnership building between the Prince Albert II of Monaco Foundation and Rewilding Europe and for seeking cooperation on conservation initiatives in Europe. 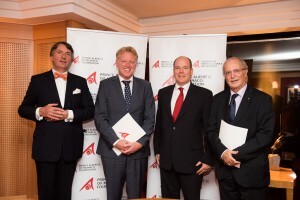 From right; Mr. Bernard Fautrier, CEO and Vice-President of the Prince Albert II of Monaco Foundation, HSH Prince Albert II of Monaco, Mr. Frans Schepers, Managing Director of Rewilding Europe, Mr. Wiet de Bruijn, Chairman of Rewilding Europe Supervisory Board. — Bernard Fautrier, CEO and Vice-President of the Prince Albert II of Monaco Foundation, explains: ‘’The Foundation very much likes Rewilding Europe’s approach, which provides new and innovative ideas to conservation in Europe. This resonates well with the Foundation’s ambitions towards outstanding initiatives and innovative solutions’’. — ‘’ Europe offers great opportunities and can become a world example for rewilding and supporting wildlife comeback’’, says Frans Schepers, Managing Director of Rewilding Europe. ‘’We are very much looking forward to work with the Prince Albert II of Monaco Foundation to promote and explore meaningful rewilding efforts in Europe together’’. A number of potential fields of cooperation have already been identified; among others saving the biodiversity-rich Mediterranean mosaic landscapes, protecting and restoring key wildlife species, communication about Europe’s natural heritage, and help building resilience to climate change of river delta’s. To manage water resources and combat desertification. To find out more visit the Prince Albert II of Monaco Foundation web page and Facebook page. 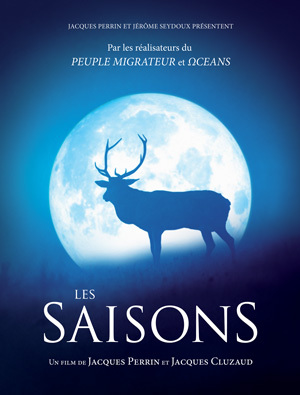 The movie ‘Les Saisons’ by Jacques Perrin and Jacques Cluzau will be released in cinemas on 27 January 2016. ‘Les Saisons’ movie trailer can be seen here.